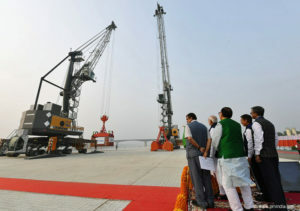 In mid-November, the first Indian inland waterway terminal was opened on the Ganga river in Varanasi, 780km east of Delhi. The terminal was officially inaugurated by India’s Prime Minister Narendra Modi. This is the first of four multi-modal terminals currently under construction on the National Waterway-1 (river Ganga) as part of the World Bank-aided Jal Marg Vikas project of the Inland Waterways Authority of India. The other terminals are being developed at Sahibganj, Haldia and Gazipur. The project will enable commercial navigation of vessels with capacity of 1500-2,000 DWT on the river Ganga. At the inauguration ceremony, Prime Minister also welcomed India’s first container vessel MV Rabindranath Tagore that sailed from Kolkata delivering containers with food and beverage to Varanasi. Container movement on an inland waterway in India is being done for the first time after the Independence. The vessels calling at Varanasi via the river Ganga will be loaded and unloaded by Liebherr mobile harbour cranes type LHM 180. Both cranes were initially sold to Afcons Infrastructure Limited. Afcons is part of the Shapoorji Pallonji Group and is one of the top infrastructure development companies in India with presence in various parts of the world. Both Liebherr mobile harbour cranes are running with a 390kW Liebherr diesel engine and provide a maximum lifting capacity of 64 tonnes in four-rope configuration. Whether it is containers, bulk or general cargoes, with a maximum outreach of 35m the LHM 180 is the right handling solution for feeder and handysize ships sailing on the river Ganga.